I compose a drawing by weight! 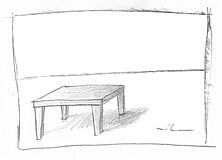 When I plan to draw a table for example, I picture how much the table weighs in real life. A table that's large for instance or made of dense wood is heavy while a card table is light. I also asses the weight of values. A value that's dark like a shadow or deep like navy blue is heavy, 'appears' to be heavy, while a sunbeam or pale color appears to be light. Once I have assessed object and value weights, I compose my drawing in a way which is either balanced or unbalanced. Compositions can be unbalanced. 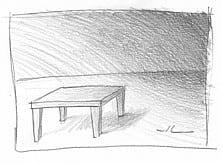 For example, if I drew a table in the bottom left corner of a piece of paper, its weight would appear to drag that corner down. If I then stuck a pin in the center of this drawing and stuck the drawing to the wall, the table would pull on the paper so much the paper would spin and wind up pointing table down. And then if I spun the paper like a pinwheel, it would wobble. Unbalanced compositions are used to express ideas and feelings strongly. My table above, for example, looks lonely. Compositions can be balanced. For example, if I added an equal weight of shading to the top right of my drawing from the previous example, my drawing would appear to even out. I could also add object(s). If I then spun my drawing on a pin like above, it would spin evenly and even wind up level when it stopped spinning. Balanced compositions are used to express ideas and feelings comfortably. Now my table looks more at home. EXERCISE - Look at a group of objects like leaves on a tree or bricks in a wall, in real life or in a photo. Focus on only a few of the objects that catch your eye, ones that you like. Draw them prominently on your paper in either a balanced or an unbalanced composition. Try following the shading rules described in the "shading" lesson.